Elegance, quality fittings, top-level finish and sensations guaranteed. 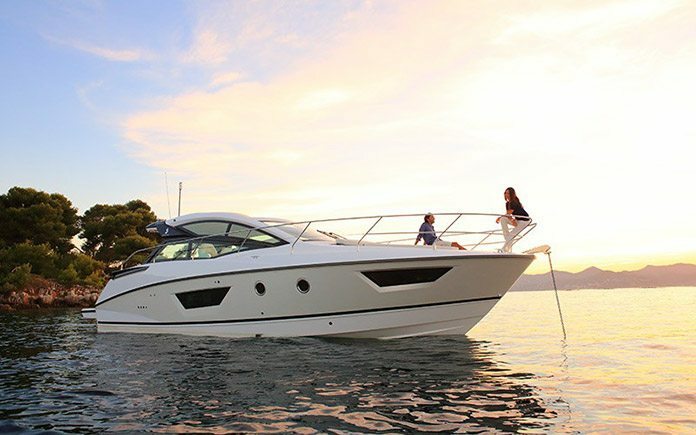 The new Gran Turismo range developed by Beneteau is full of surprises. 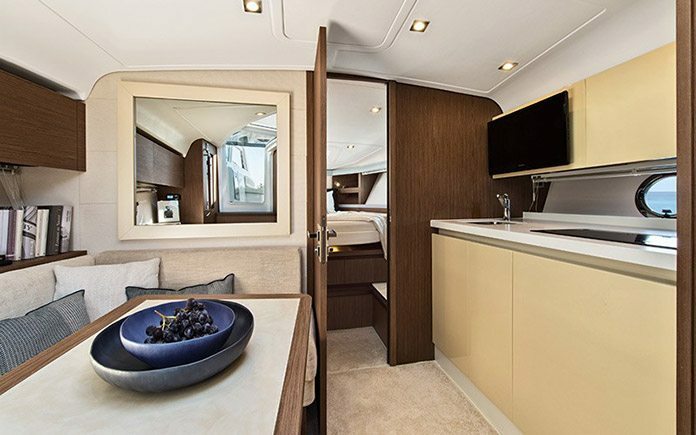 Harmonious throughout, many of the details on the new Beneteau Gran Turismo 40 boat underline the balance between her strong sporting character and the type of functions you might expect for a pleasant, luxurious yet practical life on board. In creating this boat, Beneteau sought out the well-known designers Nuvolari and Lenard who have already designed several legendary craft of this type. The builder has also made use of the latest innovations from his motor boats design office, applying all the technological resources available, with a view to offering outstanding comfort and sensations, as well as exceptional performance. 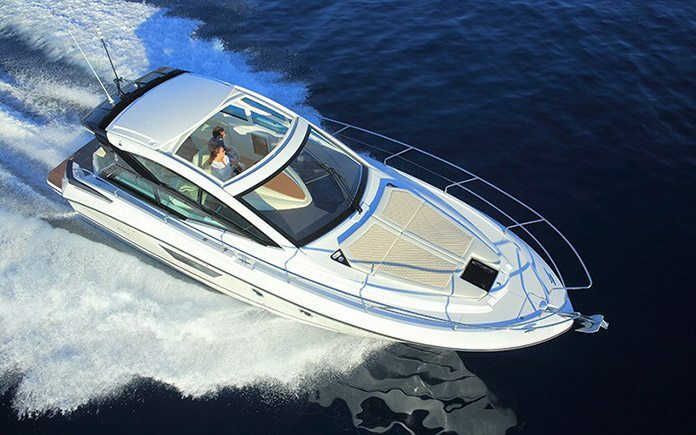 Ingeniously combining the protection afforded by a hard-top boat and the sensations of an open craft, the Gran Turismo 40 has a hard top which can be pushed right back. The electrically powered side glazing means that the ultra-spacious cockpit can be freed totally to accommodate up to twelve people. The conversion of the cockpit seating into immense sun-loungers increases still further the boat’s relaxation space, adding to the boat’s already generous 4m2 sunbaths with adjustable backrests up on the fore deck. No detail has been overlooked. In a marriage of speed and style, the new Gran Turismo 40 is as pleasant to admire as she is to drive. Designed to stand out on the water, her lines are elegant accentuated by a streamlined hull and the hard-top with its carefully designed side glazing. 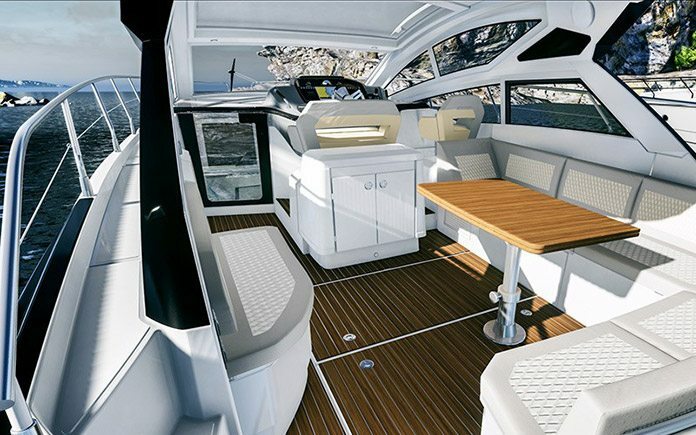 Enhancing both visibility and comfort, Beneteau has centred the three- seater helming station. With the latest generation Air Step planing hull, this new Sport Cruiser gives you driving sensations and a level of comfort whereby you can sail safely and comfortably at speeds of up to 35 knots. 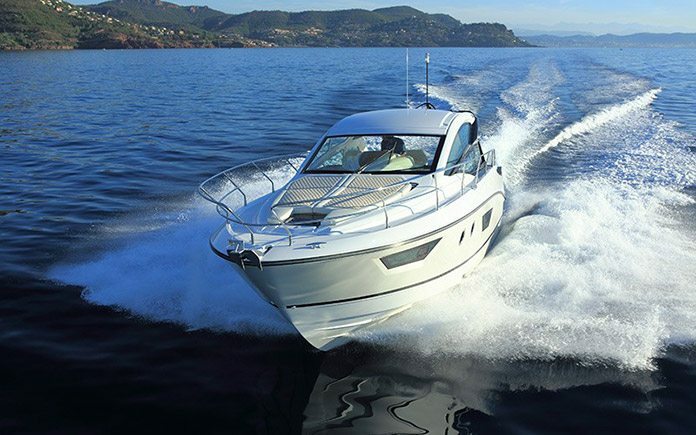 The Volvo Z Drive engine makes this new motor boat particularly manoeuvrable. For a wonderful entry to nautical and aquatic experiences, the vast swim platform, (1.30 m deep) with motorization as an optional extra, can be lowered to just below sea level. 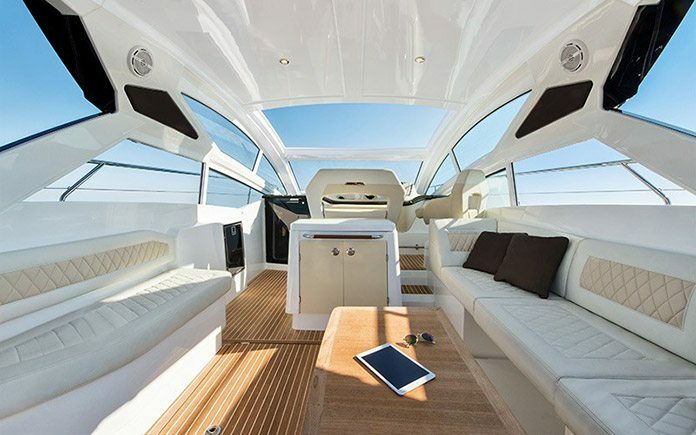 Linking life on board and the sea, it offers features you find on great yachts. It is particularly useful for stowing the tender when sailing. The layout of the lower deck provides a feeling of space which has never been seen before on a boat of this size. Facing the spacious convertible saloon with large hull windows, a proper fully-fitted kitchen galley complements the deck kitchen. 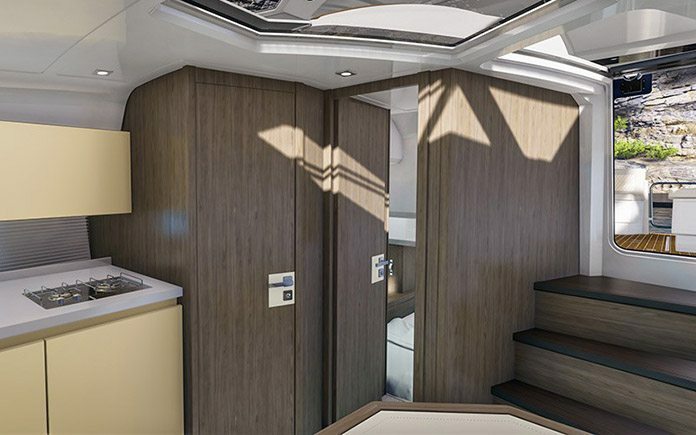 With her two cabins, and a real washroom with separate shower, the Gran Turismo 40 clearly stands out for her habitability.